From team compliance to intelligent meeting assistants, Cisco provides a look at the here and now and what's to come with its Webex portfolio. Beyond announcing a Spark rebranding and a video-fueled Webex makeover (see No Jitter coverage here and here), Cisco yesterday discussed several other collaboration-related products in various stages of development. With Webex Teams (formerly Spark), Cisco is tackling the challenge of maintaining compliance in multi-company collaboration environments, as Jonathan Rosenberg, VP and CTO for Cisco's Collaboration business, demonstrated on stage at the company's two-day Collaboration Summit. Cisco addresses the need for external collaboration by allowing all users to reside in a single, shared Webex Teams cloud instance. It addresses the compliance challenge by applying content policies across that instance. If the content monitor detects an issue within a Webex Teams conversation, the noncompliant messages get deleted in near real time. While all team members can see that a message has been deleted for noncompliance, the participant at fault receives an alert so he can correct his behavior for future interactions. Cisco's approach to multi-company collaboration doesn't rely on setting up guest access for team collaboration instances – a model that it considers not only as a "huge pain," but also as a "huge security risk," Rosenberg wrote in a Cisco Blogs post. "Guest accounts enable users to share information outside of their company in a way that cannot be tracked by compliance tools," he said. The compliance monitoring is in use by Cisco customers today, Rosenberg said. When it comes to meetings, huddle rooms are proving to be a rather popular trend, with many enterprises taking small, unused rooms and spaces and outfitting them with collaboration solutions. 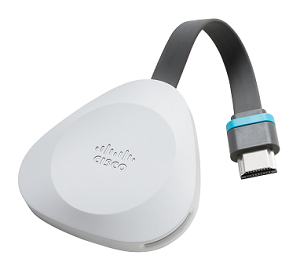 Targeting such meeting spaces, Cisco has introduced Webex Share (shown at right), a small, pluggable device that converts any old TV or monitor into a Webex wireless presentation screen. "No longer do users need to connect any cables or dongles, or adjust AV settings, just to get content on the screen," Snorre Kjesbu, VP & GM of Meeting Room Systems, wrote in a Cisco Blogs post. "Simply walk into a room, pair with the system using the Webex app on your laptop, and immediately start sharing an application or your entire screen." Demonstrating the capability on stage, Rowan Trollope, Cisco's SVP & GM, Applications, converted a standard TV into a Webex monitor in a matter of minutes. While Cisco didn't share pricing or availability details, Trollope promised more information on Webex Share this winter. Cisco, which has long been partnering with Apple on a variety of collaboration initiatives, yesterday revealed the two companies are now working to add augmented reality (AR) into meetings The idea is to allow smartphone users to project 3D models of objects in their physical meeting rooms -- such as Angie Mistretta, director of Cisco Collaboration Endpoint Technology Marketing, did on stage with a 3D Webex Board. With the AR smartphone app, a user would be able to make the object smaller or larger, rotate it, and then physically walk around it for a 360-degree view. Details were sparse, but Trollope said the AR capability ultimately would be available as a standard update to Webex. 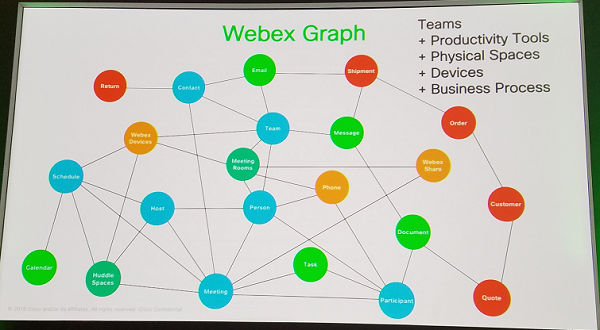 Also from the keynote stage, Rosenberg introduced the concept of the Webex Graph, a key element of a unified collaboration platform, he said. "Webex Graph is a data model that encapsulates all the objects in a system -- whether it's people, meetings, devices, messages, spaces. Every one of these things exist in a system with all these connections between them," Rosenberg said. "And as users use Webex, all of their interactions add more data to the system." Internally, the Webex Graph uses this data to make the system smarter and more intuitive -- so if you're searching to create a meeting with a colleague named Maria, the Graph would surface the profile of the Maria with whom you work with most frequently. Additionally, Cisco can expose the Webex Graph via API to developers for their own innovations, Rosenberg said. Webex Graph is a work in progress, but the people and devices elements are available today, with more endpoints to be added over time, Rosenberg said. Speaking of added smarts, as part of its Spark-Webex rebrand, Cisco has renamed Spark Assistant as Webex Assistant, which Trollope and Tim Tuttle, formerly CEO of Cisco's MindMeld acquisition and now CTO in Cisco's Cognitive Collaboration Group, demoed on stage. Webex Assistant will launch in May with basic AI command and control capabilities such as the ability to start and end a meeting, schedule a meeting, and add participants to a call. Over time, Webex Assistant will gain natural language understanding and semantic understanding with domain expertise, and ultimately be able to function as an intelligent team member and provide team and strategic intelligence. Cisco is targeting not just room systems, but desk phones and all other endpoints. As Tom Puorro, VP & GM of Cisco's UC Technology group, said on stage, "Talk about breathing new life into the 100 million plus phones we have out there!"